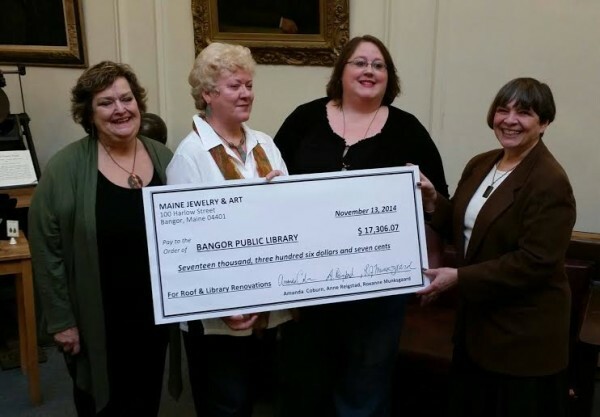 Photo courtesy of Roxanne Munksgaard The owners of Maine Jewelry & Art Gallery and Studios in Bangor awarded a check on Nov. 13 for $17,306.07 to the Bangor Public Library. The funds are from sales of jewelry and accessories crafted by the gallery owners from the library’s 102-year-old copper roof, which was replaced earlier this year. Taking part in the ceremony to award the funds are (from left) gallery owners Roxanne Munksgaard, Anne Reigstad and Amanda Coburn, and Bangor Public Library Director Barbara McDade. Coburn, Reigstad and Munksgaard have designed and created more than 1,000 pieces of jewelry from the old roof. BANGOR — A partnership that blossomed over a copper roof has resulted in a relationship that continues to benefit a local business and the Bangor Public Library. On Nov. 13, downtown business Maine Jewelry & Art presented a check to the Bangor Public Library. More than $15,000 has been donated to the library as a result of the copper jewelry that Maine Jewelry & Art owners have produced from pieces of the library’s old copper roof since January. Maine Jewelry & Art, Gallery & Studios, located at 100 Harlow St., is owned and operated by three jewelry designers and artists, Amanda Coburn, Anne Reigstad and Roxanne Munksgaard. The artists and gallery owners have designed and handcrafted unique jewelry and accessories from pieces of the copper roof for both men and women, including book clips, tie tacks, cuff links, earrings, necklaces, money holders and more. The Bangor Public Library offers free programming and services to the public. The library, since the completion of the work to replace the library’s copper dome and roof, is in the process of the interior renovation, with construction to begin in December. For information about the programs and services the library offers, visit bangorpubliclibrary.org or call 947-8336.